With homemade pancake mix, delicious from-scratch pancakes are only minutes away! 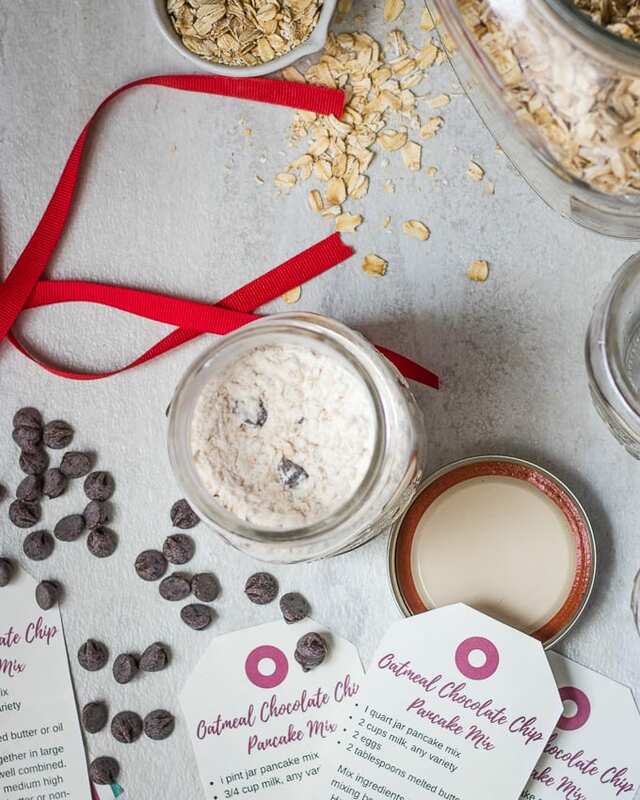 Share these adorable and delicious Oatmeal Chocolate Chip Pancake Mixes for a perfect Holiday Gift or stock DIY Pancake Mix in your pantry for busy mornings. This Homemade Pancake Mix Recipe includes printable gift tags with instructions, as this Pancake Mix makes the sweetest gifts to give. Are you looking for the sweetest gift to give? A gift that ANYONE would appreciate? A gift that is homemade, heart felt, and a special treat for a special someone? A gift that is frugal but appreciated? Then I have the PERFECT DIY gift for you! With a few simple ingredients, you can make an inexpensive gift that anyone would love to receive? But truthfully, while you are at it, you will want to make a triple batch of this Homemade Pancake Mix so you can stock your own pantry with DIY Pancake Mix. I mean, who doesn’t LOVE to have homemade pancakes on a Saturday morning?! 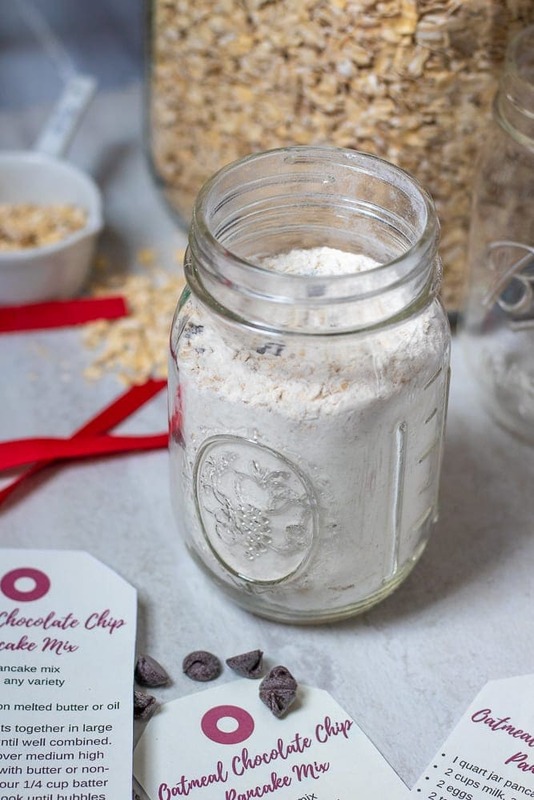 In a very large mixing bowl, mix together oats, flour, baking powder, flax seed, baking soda, salt, and chocolate chips, until evenly combined. Divide mixture between pint and quart sized jars. about 4 cups pancake mix for the quart sized jar. Print off and attach gift tags I have included. Gift tags that work for any sized jars. Stock these Homemade Pancake Mixes in your Pantry or deliver DIY Pancake Mixes for a perfect hostess or holiday treat. See how totally awesome I am–a free gift card template and a frugal gift idea. The following contain affiliate links, which I make a small fee We are a participant in the Amazon Services LLC Associates Program, an affiliate advertising program designed to provide a means for us to earn fees by linking to Amazon.com and affiliated sites. This recipe makes enough for 4 Quart sized gift jars or 8 pint sized gift jars. I used these quart size jars or pint size jars, and ribbon to complete these homemade gift jars. Make them more festive by gifting them with a Christmas Spatula or pancake molds . Quick cook oats or old fashioned oats both work in this Homemade Oatmeal Pancake Mix. I prefer the texture of quick cook oats to contrast against the wheat flour. I add ground flax seed to my DIY Pancake Mix, for fiber and omega 3 fatty acids. You can omit and add additional oats instead. Whole wheat flour is my go to in my kitchen and in my Homemade Chocolate Chip Pancake Mix. However, you can easily use all-purpose flour or Gluten-Free Flour Mix and make Homemade Gluten Free Pancake Mix. Keep Oatmeal Pancake Mix on hand for EASY mornings and a fun breakfast or give these pancake mixes as a gift. Who wouldn’t love to have these chocolate chip pancakes on a Saturday morning? Or any morning??? So easy. I love this idea Kristen. I’ve given and received this type of mason gift jar and they are so thoughtful and appreciated. The printable tags are the perfect touch. I love pancake mix and love the addition of the oatmeal and chocolate chips. What a great idea for a fun homemade holiday gift! This is awesome and easy enough for even me to do! Love this idea! I love making gifts in jars like this one. They’re so fun, personalized, and budget friendly! Thanks for the printable, one less thing to do. I love oatmeal cookies and I bet they would make pancakes taste amazing! They sure do! You will love these! What a great idea for a little hostess or teacher gift for a fun Christmas morning breakfast! What a great idea! This would be great for a teacher’s gift. Lovely idea! I’ve been thinking of Christmas gift ideas for my cousins. Nichole, this would make a great gift for ANYONE! Hi Kristen – I love this because it’s a different idea for a gift in a jar, and I’m guessing the pancakes are fantastic! Thanks so much for sharing with the Let’s Get Real Party. Love the tags, thank you for sharing. I wanted to try these before I made them in the jars. I’m wondering if I did something wrong. I made 1/8 of the mix, which should be 2 cups, right? It was a little shy of 2 cups, but I added the wet ingredients and the batter is super runny. Did you usually let it soak in to the oats before cooking? I bet your consistency was off due to dividing the recipe. But I will test 1/8 of it to see for sure. I doubled the dry ingredients and the consistency was perfect for 2 eggs and 2 cups of milk! !